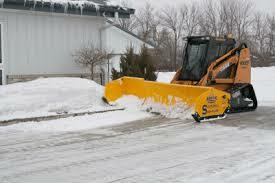 There is a lot to learn about how to start a Snow Removal Business. Most people would consider the obvious things such as buying equipment, hiring operators and getting customers. These are important but there is a lot more to it than that! Take your time and set up your business properly. The following could make the difference between a successful business and losing your shirt. Forming a company, obtaining tax numbers, hiring a lawyer and an accountant , finding mechanics, storage for your equipment, fuel contracts, billing software , bank accounts, insurance, setting budgets, managing cash flow, are just a few of the things that new business owners must think about. A lot of people start with small beginnings. They might have a snow blower and offer to clear snow for a few neighbors and charge a reasonable price for doing the work. As long as the number of driveways are kept small and close by, it is very manageable. Once you go beyond this and decide to advertise or purchase additional equipment and take on more customers it is starting to get serious. All of a sudden it is important to consider the tax consequences of your business. You will need a formal business name and you will need to register the business as well, this means getting a business number and a tax number so that your accountant can file a tax report at the end of the year to claim refunds or pay taxes on the profits. You will be spending money on equipment as well as fuel for your equipment. There may also be parts and repairs to be done and you may even hire part time contractors to help you out. If they become employees, this triggers and entire new set of issues. You will need to pay them of course and also manage withholding taxes etc that then must be paid to the government on their behalf. At the end of the year you will need to issue tax receipts for them so they can do their taxes and you have to file a tax report on behalf of your company showing all of the expenses, the revenue and depreciation of your equipment. Time to hire an accountant! Then there are the day to day operations. Someone to take phone calls, manage contracts, schedule work and pay salaries and taxes etc. This person will form the nucleus of your small operations center which will grow over time. There are two things that really irritate customers. The first and main one of course is that they want to have their driveways cleared of snow. Most people want this completed on time for them to get out and get to work. The second thing that can irritate customers is poor customer relation management. This is the person who takes the phone calls and relays the information to the operators. This same person may prepare contracts and bill customers. If it does not get done right, then you have another irritated customer. This can include just answering the phone and listening to the customer. All equipment breaks down from time to time. As an owner operator most people will take very good care of their equipment. Which in turn will ensure that breakdowns are kept to a minimum. On the other hand, employees are just not that kind to equipment. Especially equipment that they do not own or have a stake in. Repairs will be needed and back up plans, back up equipment and backup parts will need to be considered. Operators will take these steps to ensure that your customers remain satisfied. All of the above issues and more should be laid out in a business plan. The plan includes your budget, your cash flow and loans if needed to buy equipment. Developing a business plan forces people to think through the many business issues and prepare for the startup, the growth and the sustainment of the business. The business plan should be set up and then updated at least once a year and more often if there are major changes in the business. Any lender that you approach will want to see a solid business plan that you are committed to before they will lend any money for equipment loans or operating loans. It is your best tool as well to help you achieve profitability quickly and avoid losses. These are just a few of the items that every small business owner has to consider when they start a snow removal business!